Congratulations to Grigory Kalinovsky and Joseph Swensen, who became inaugural Starling Professors of Violin at Indiana University's Jacobs School of Music this fall. Both had joined the IU faculty in fall 2013. 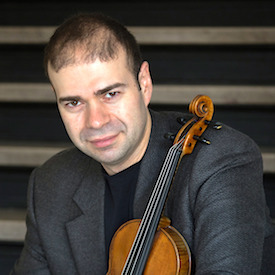 Grigory Kalinovsky, who also teaches at the Pinchas Zukerman Young Artists Program in Canada, Heifetz International Music Institute and Manhattan in the Mountains, previously was a faculty member at Manhattan School of Music. A native of St. Petersburg, Russia, Kalinovsky started his music education with Tatiana Liberova then continued his education in New York, graduating from the Pinchas Zukerman Performance Program at Manhattan School of Music, where he studied with Patinka Kopec and Zukerman. His recording of Shostakovich’s Violin Sonata and Twenty-Four Preludes with pianist Tatiana Goncharova was praised by the composer’s son, conductor Maxim Shostakovich, as “a must-have for any Shostakovich music connoisseur.” Kalinovsky has has taught at many summer music festivals, including the Bowdoin International Music Festival in Maine, Soesterberg International Music Festival in Holland, Summit Music Festival in New York and Pavel Vernikov’s festival “Il Violino Magico” in Italy. Born in Hoboken, N.J., Joseph Swensen was raised in Harlem, N.Y., by a Japanese-American mother and a Norwegian-American father, both professional musicians. He attended Juilliard from the age of seven, first as a piano student of Thomas Schumacher and Christopher Sager and then, at the age of nine, as a violin student of Dorothy Delay. He studied chamber music with Robert Mann and other members of the Juilliard Quartet, Leonard Rose and Felix Galimir. He studied composition with David Diamond and Vincent Persechetti, and coached privately with Isaac Stern over a 10-year period. A passionate chamber musician, Swensen performs in recital with pianist Jeffrey Kahane, and with his trio, Kahane Swensen Brey, alongside Kahane and cellist Carter Brey. 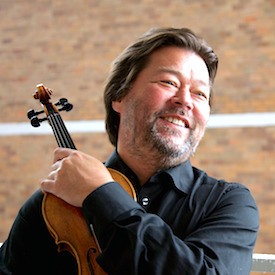 He is an active guest conductor and longtime violin soloist. You can check out his recent TED talk, called Habitats for Music and the Sound of Math, here. For more details about both violinists, here is the full press release from Indiana University.